Our Suzy was a rescued dog. We had her since January 2007. The Vet had estimated her age at about 5 or 6 years. She was found in Northern Lower Michigan where she had been living in the wild. We have no idea how long she was living that way and the people who found her were unable to find her owners. When she was found, she was trying to eat road kill. 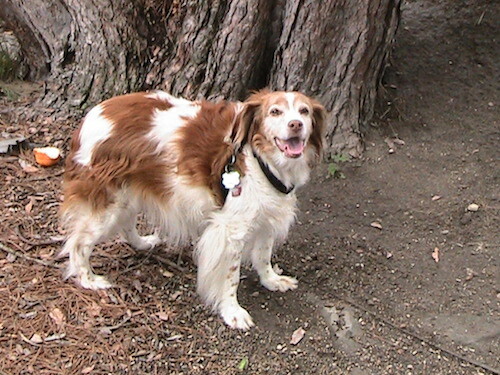 We have had five other Brittany's in the past. One we brought back from Norway. All our Brittany's were very good with the kids. When they would come to visit, Suzy was always happy to see them. She would never panic when left alone. She knew we would eventually be home. She enjoyed meeting people and making friends. In the car she enjoyed looking out the window and never bothered the driver. We have a fenced yard and she enjoyed exploring and chasing the squirrels and birds. She enjoyed the outside and especially loved to be out in the snow. In the summer she would sneak in the garden and pick green beans to eat. We also have two cherry trees and she would pick and eat cherries off the low branches and spit out the seeds. She also enjoyed going to pet shops. The first time we took her to Pet Smart, she didn't know what to make of it. When we got to the door, she was startled when the automatic door opened. Once she got used to the store, she wanted to explore. She didn't know about toys and I guess she never played with a ball. Throw one to her and she would just look at it. When we took her for walks, we had to keep a leash on her. When she caught a scent or got curious, we couldn't call her off of it. I think that is how she got lost from her former owner. We live near Lake Huron and she enjoyed going for walks on the beach. She had her quirks. When she ate she would dump her food and eat it off the floor. She would not go into the basement so we never forced her. When we did go down there she would wait at the top of the stairs until we came back up. She had given us a lot more in return. We have a sign that says "A Spoiled Rotten Brittany Lives Here."